This love month, here’s something that will make you believe in forever and happy-ever-afters. 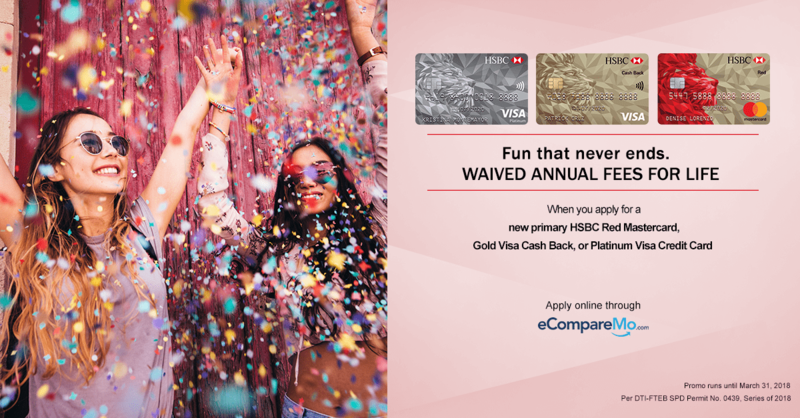 HSBC is offering waived annual fees for life for applicants who apply for a new primary HSBC Credit Card. Simply apply online until July 31, 2018 and enjoy perennially free annual fees. Apply to HSBC for the first time. You need to have an existing credit card from other banks for at least a year. You can’t have an existing or cancelled HSBC Credit Card. You must apply online. You need to apply for your card either through www.hsbc.com.ph or eCompareMo. You must apply during the promo period, until July 31, 2018. Take note that the free annual fee for life benefit is non-transferable. It also cannot be converted or exchanged for cash, credit, benefit, advantage, or property. This promo also cannot be availed in conjunction with other ongoing HSBC credit card acquisition promos. Start the new year right and experience the joy cashless shopping convenience–with no annual fees. Get yourself an HSBC Credit Card today. No HSBC Credit Card yet? Apply online now!